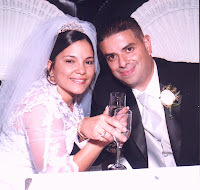 Yesterday my husband and I celebrated 5 years of marital bliss. 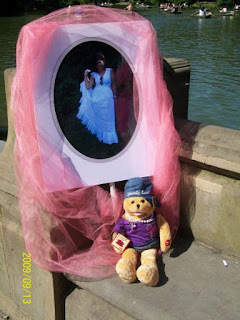 It seems like only yesterday we were planning our wedding, I can't believe it has been 5 years already! We spent the day low key relaxing at home, it was raining here in South Florida, so it gave us an excuse to lazy around the house. Of course like all special celebrations food was to be involved, but we had already decided that for this year's Anniversary we would stay in and have a home cooked meal, so it was ok to keep the day low key. We did go out for a portion of our day so that we could attend church services (http://www.gochristfellowship.com/). We were blessed with a wonderful sermon from our teaching pastor John Maxwell on "Paying it Forward". We know that we have MANY blessings in our lives (including that of our marriage) and are thankful for that! After church it was time to get the final touches for our dinner then home to get things going. On the menu was Flank Steak with Garlic Tomato Jam, and Arugula Salad; recipe presented on the Today show this week ~ a recipe I got from the Today Show: http://today.msnbc.msn.com/id/32878607/ns/today-today_food_and_wine/ (all ingredient info is at the end of this blog). First I prepared the garlic tomato jam; it had to cook down so it was going to take a bit longer than everything else. Then I prepared the Arugula Salad; I varied the recipe by adding some spinach as well, but the ingredient that turned out to be key in the salad was the freshly grated parmesan cheese ~ YUMMY! Then it was on to the steak, which I had marinated all day in a roasted garlic & herb marinade (store brought ~ another variant to the recipe as presented on the Today Show). The steak smelled absolutely delicious while it was cooking (sorry, the aroma distracted me and I forgot to photograh it); and once topped with the garlic tomato jam it made for a deliciously looking professional presentation (ok, I will let you judge for yourselves). Once everything was ready, and the table was set, it was time to dig into our special meal. ...and of course no special occasion meal is complete without a special dessert (thank goodness we left room for dessert). Thanks to my beautiful sister Carmen, we indulged in red velvet cake ~ thanks Sis! We ended the night with a movie. It was a wonderful meal, and a wonderful anniversary! I am thankful for this and all the blessings I have in my life. For the past 16 years my family and I have taken on the challenge to raise funds in support of the Greater New York City Affiliate of Susan G. Komen for the Cure in its efforts to END BREAST CANCER FOREVER. 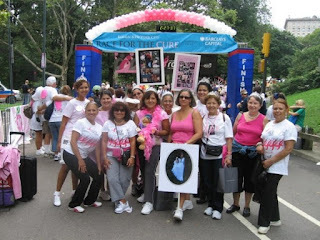 Last Sunday, September 13, 2009 our team The Pink Sisterhood met in Central Park to continue the tradition. We have participated in this event in honor of three of my sisters (pictured right: Edna, Carmen and Vilma) who, until earlier this year, were all breast cancer survivors. However in Februrary, my sister Edna went to be with the Lord. She faced this battle for 28 years with grace and dignity. She inspired all of us to bring attention to this cause and to raise awareness that early detection is the best advocate in this battle. So this year the event took on a special meaning. We laced up our sneakers and walked in celebration of her life and of her years of survival, but we also walked to celebrate the continued survivorship of my sisters Carmen and Vilma, and for all of those who are part of this great SISTERHOOD. We were joined in the park with lots of family and friends! It was truly a day of CELEBRATION! Our team was blessed to have been able to raise over $3000 towards the cause. My siblings and I were so pleased to have such great support for our cause and our team. We know that we are truly blessed with a wonderful and supportive family, as well as wonderful and supportive friends. I want to take this time to personally thank ALL of you who participated and supported The Pink Sisterhood in the Komen New York City Race for the Cure®. The race to end breast cancer is not over yet, and continued support is always appreciated. 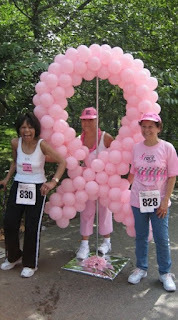 If you wish to suppor the team please visit http://www.komennyc.org/site/TR/Race/race2009-wide?team_id=31380&pg=team&fr_id=1170. 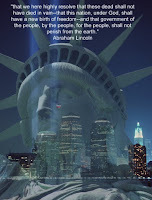 ...to remember those lost, and the change that came to the United States of America eight years ago today. From Pink @ Heart to Puerto Rican Chef in the house! This morning I started my day with a splitting headache; to be exact, it was a continuation of how I started my weekend. It was no way to start off a 3 day weekend nor was it the way to start off a Sunday morning. The headache was enough to keep me from church, but thankfully my church offers an online campus, so it wasn't a total loss. After getting a late start to my day, I decided cook. For most people this would not mean a major event, but for me ~ well not so simple. For me this meant grocery shopping for ingredients, you see to me Sunday dinners should be special, not your run of the mill ("typical") meal. So deciding to cook on this Sunday meant planning out a "not your everyday" recipe and a trip to the farmers market. I had been mulling around with an idea to do my own "Julie & Julia" type cooking experiment, but with a Puerto Rican twist. So today I decided to test the waters of this potential experiment and make Sancocho. For those of you not familiar with it, Sancocho is Puerto Rican stew. I followed the recipe I found at http://www.elboricua.com/index.html, a website I recommend for all those who want to venture into authentic Puerto Rican cooking. Puerto Rican cooking is something I grew up with, and my mother made it look easy! Over the years I have been adventurous, dabbling in a few of the more complicated Puerto Rican recipes, not just your regular rice and beans. The thing I cannot say about some of the recipes is that they are easy! ("Mom how did you do it?"). But now it was time to see how I faired at making sancocho. First things first, the base of most Puerto Rican recipes is know as "sofrito". The sancocho recipe did not directly call for sofrito as a base, but I decided to start easy (and authentically) and make my own. I usually use the store brought frozen kind and have only occasionally made my own. So I packed everything in to the blender... ...and viola! Sofrito! ...the next step was to let it cook! The end result... ...not bad if I do say so myself. ...mmmmmmm, looks like it was a success! So the experiment is off to a positive start! Stay tuned for the dish! My sister sent me this video. I enjoyed watching it, the message is great! I hope those of you who may see this blog and view the video would be blessed. No one is perfect, and it is not easy to face our short falls. It is wonderful to know that God has made us each a masterpiece in his own sight; and that through God's amazing mercy and grace, given to us through the sacrifice of his son on the cross we are forgiven of our sins and short falls. What wonderful blessings we receive when we come to the Lord and put him first in all our needs, allowing him to mold us into his masterpieces. My sister and I recently accepted the challenge of being part of the planning committee for one of our local American Cancer Society (ACS) Relay for Life Events (http://www.relayforlife.org/relay/). We will be planning the event for Royal Palm Beach, Florida. This past weekend I had the pleasure of spending a portion of my weekend in Orlando, Fl. with my sister Carmen. We attended the Florida Division Relay for Life Summit. It was a weekend filled with lots of great training, lots of information on making our event great, but especially filled with a full gamut of emotions over the stories of hope and celebration of those who have fought and won, and sometimes lost, their battles with cancer. Having such close relations to cancer survivors and cancer victims (my sisters, my cousins, etc. ), I could fully relate to many stories that were told. While I have participated in Relay for Life events in the past, I have never fully taken in the meaning of the event, until the event I participated in this past Spring. The event is a chance to celebrate the lives of those living with cancer, remember those who have past away from cancer, and best of all a chance to join in the fight to eliminate cancer. The signature color of the event is Purple; so to explain the blog title today, I would have to say the Power of Purple is the power that each of us as individuals has when we participate in the fight to eliminate cancer, but even more so it is the power of that we have as a community to join forces to help the ACS achieve its mission. I am (and will always be) Pink at Heart, but for at least 17 hours next April (and for all Aprils to come) my blood will run purple, with a hint of pink! I encourage all of you who read this blog to look into and participate in your local Relay for Life event. If you don’t have one yet, contact the ACS to get one started. And if you cannot participate, be sure to support someone who is participating in their own event. Be sure to check out http://www.relayforlife.org/ for more information on relay and to see about the relay in your area. We all should learn something new everyday! Today I have chosen to share one of my lessons of the day. Merriam-Webster's Collegiate Dictionary recently released information on newly added words for 2009. I looked these over and was surprised that some of these words weren't already in the dictionary. I grew up Catholic so a missalette was something I was always familiar with ~ who knew it was not a listed word; and naproxen has been around long enough that I would have thought it would have already been there as well, but both of these are listed among the new words for 2009. The other thing I found interesting about some of the words is how much our world of social networking, reality television, environmental awareness and recession has influenced the words we use on a regular basis to the point that some of these have made it into the dictionary fairly quickly. I was curious about how quickly some of these words have made it into the dictionary while some have taken much longer. I did look it up, basically it is all in how many people use it and in how a word is used, at least in regards to how a word enters the Merriam-Webster Dictionary. So I can see why a word like misselette would take longer than frenemy; here is the website if you to would like to learn more about how words get into the dictionary: http://www.merriam-webster.com/help/faq/words_in.htm. So now I am off to plan my next staycation, where I will catch up on some fan fiction or the latest webisodes of my favorite programs; hoping any frenemies I may have will leave me alone to enjoy my goji berry smothie and my locavore while I try to reduce my carbon footprint on the world. I will be sure to post a vlog of my fun and I won't do it using a sock puppet, so as to be sure you know it is from me.